Nerd Clinic: Percep. & Cog. Factors in Perf. SIGN UP NOW FOR THIS COURSE! 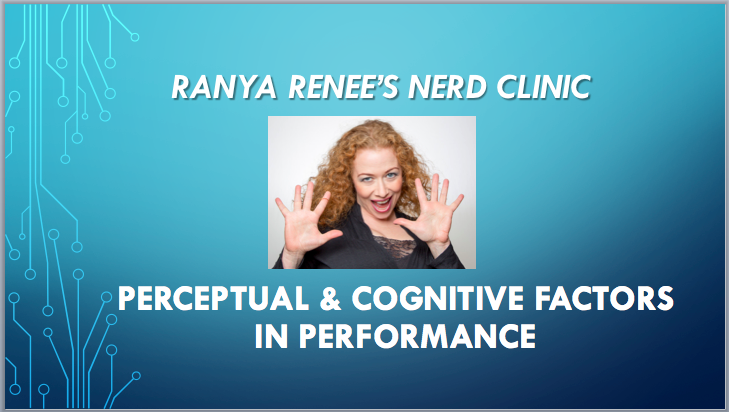 I'm excited to offer this two-part presentation-workshop, Perceptual & Cognitive Factors in Performance, online for the first time. It is a workshop based on a talk i gave at the June 2018 Austin Belly Dance Convention, and I'm so appreciative to the ABDC for that opportunity to develop it. I will be sharing the PowerPoint presentation as well as discussing (and brainstorming with you) how you can apply the psychological concepts in creating tools for practice in your dance. Here are the details - the live sessions will be in late October, and please join the Ginger City Community group on Facebook for a poll as we set the times for these this week. Indulge your inner dance nerd with this scholarly and practical two-part workshop for dancers, centered on performer confidence and the evaluative processes of their audiences. The way people’s brains work affects their impressions of a performance -- something worth considering in creating choreographed and improvisational work. We’ll address concepts of “top-down” vs. “bottom-up” influences on sensory perception; “feedback loops” in the cognitive process; and how preconceptions and preconscious processes can trigger unconscious evaluations in performers and audiences. You’ll leave with a better understanding how you may be seen by your audiences, and a “cognitive checklist” to apply to your creative work, to enhance your chances of making a great impression. This slides-plus-discussion workshop will be offered in two parts, across two different live time slots in October, to accommodate dancers in different locations, and will come with worksheets to apply the concepts to your own dance work. Recordings available for those who can’t attend live. We'll also enjoy some discussion after the workshops and I'll be happy to answer your questions! Got a question not answered here? Contact me directly at support@gingercity.com or on Facebook via my personal Ranya Renee profile or tag me in the Ginger City Community group page. I'M A BIG NERD AND READY TO PARTY!